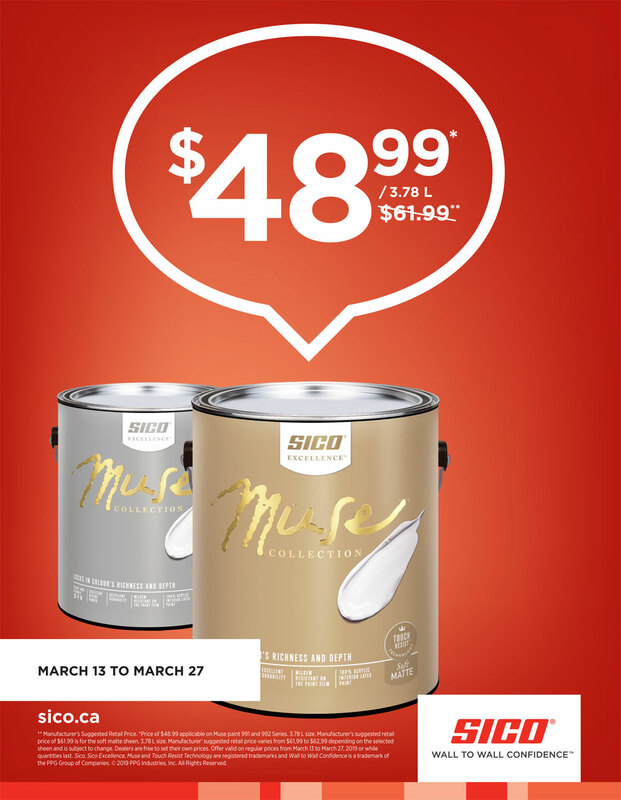 Featuring quality products from Sico Paints & Pittsburgh Paints, we have everything you need for the perfect interior paint job. From primers & paint & primer in 1 to furniture paint, if you can imagine it, we can make it happen. Visit us in store to discuss how we can help you make your home's interior magical. Everywhere you look around your home, you will see wood features. Floors, cabinetry, furniture & casings all requite TLC. 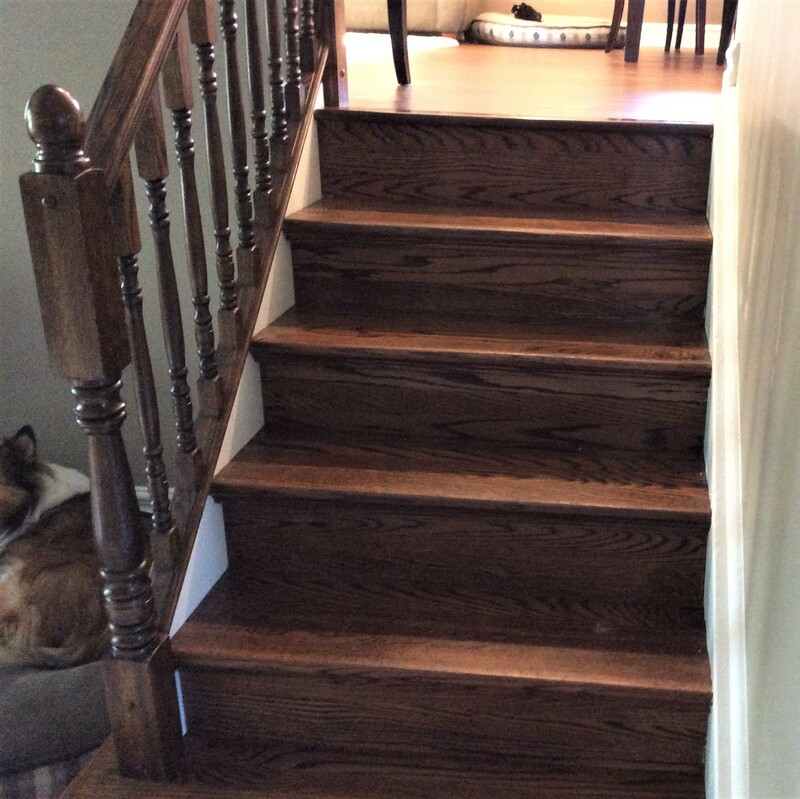 We proudly carry Minwax wood stains & urethanes so that you can use the very best wood finish products in your home. You never get a second chance to make a first impression. With quality exterior paints from Sico Paints & Pittsburgh Paints, we have everything you need to increase your home's curb appeal. People ask: Is wallpaper back? Our response: IT NEVER LEFT! We proudly offer the area's largest wallpaper sample book collection. With over 200 books in our collection, we have the patterns to make your house pop! Visit us in store to take a peek at our outstanding collection. Wood has been a popular building material for exteriors for hundreds of years. Make the most of your home's exterior wood with outstanding exterior wood stains from Sico Paints & Sico Proluxe. With semi- transparent, translucent & solid stain options, we have everything you need to protect your exterior wood. 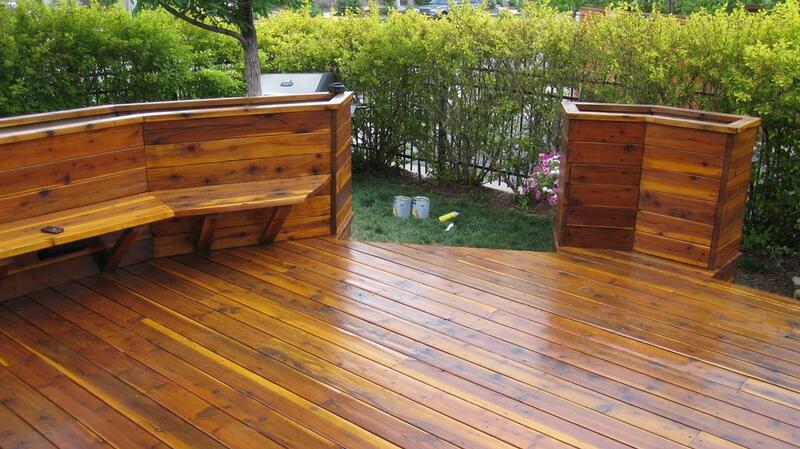 From wood siding to wooden patio furniture, we have everything you need to beautify & protect your exterior wood. Looking for a large selection of quality paint brushes & rollers? Come visit our wall of paint sundries. We carry a variety of brushes, rollers, trays & tools to ensure that you get the sundries that match your needs. 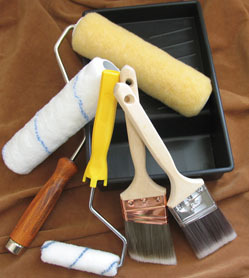 Don't compromise the quality of your paint job by using dollar store brushes & rollers. Would you buy a Porsche and then go put no name tires on it? Why Shop Standard Paint & Wallpaper? The answer is: why haven't you been shopping with Standard Paint & Wallpaper already! All kidding aside, there are plenty of reasons for you to make Standard Paint & Wallpaper your local paint & wallpaper store. Standard Paint & Wallpaper is proudly locally owned & operated. We have been operating as a small business in Burlington for over 30 years. Our ties run deep with this community. Our business model is based on customer service & quality of products. We strive to deliver the best in both service & products and deliver on both. 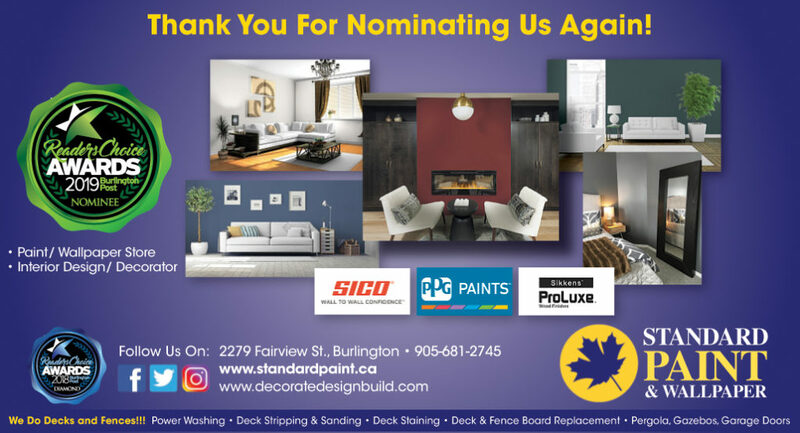 In 2018, we were recognized in the Burlington Post Reader's Choice Awards as "Best Paint Store". We are very proud of this achievement as we have faced stiff competition but we still prevailed. 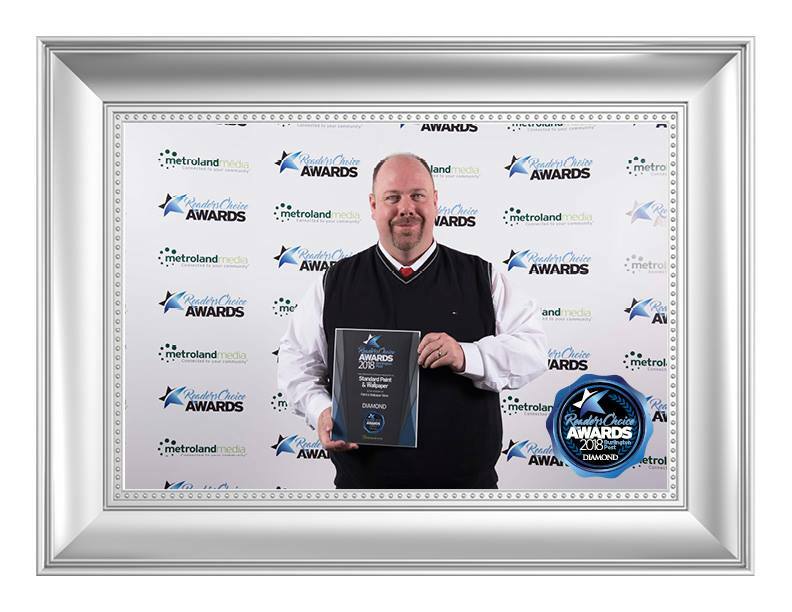 Our staff has also been recognized on multiple occasions in the "Interior Decorator" category of the Reader's Choice awards. Our goal is to offer friendly, knowledgeable staff that will do offer the best possible advice to help you beautify your home. It's your home, let us help you make it as beautiful as possible. We offer quality paint products from Sico Paints & Pittsburgh Paints. Sico has been proudly made in Canada since 1937 and offers fantastic products at affordable pricing. Pittsburgh Paints is one of the world leaders in the paint industry. Their product selections include what I consider to be our finest product: Manor Hall. 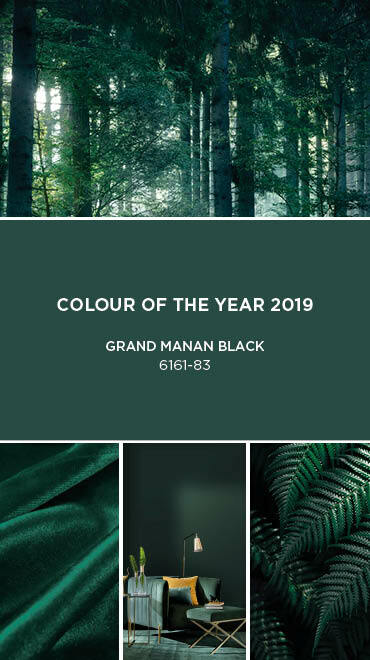 Manor Hall interior paint is a paint & primer in 1, contains a mildewcide so that it is suitable for kitchens & bathrooms and has a stain repellant to provide optimum washability. We accept the challenge of our competition and want ant you to compare. We know that we can deliver superior service with outstanding products at a comparable price to the big boxes. Shop the pre-eminent name brand and you will find that our service & products are superior at a much lower price. Standard Paint & Wallpaper will deliver the absolute best customer experience in the local paint industry.